Paul Fussell, who died this week at 88, is being remembered for his ground-breaking work, The Great War and Modern Memory, his funny, if sometimes rather mean-spirited, takes on American culture, his powerful voice debunking the romanticism of war, and the animus of his ex-wife, found in her louche autobiography. But missing from the many obituaries that have been published, is any account of how good he was as a teacher. He was very good. 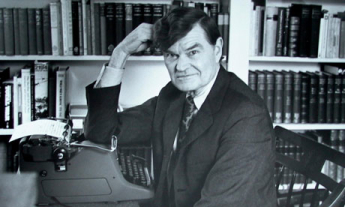 For me, Paul Fussell will always be the inspiring and rather frightening professor who taught me as a freshman at the University of Pennsylvania. It is true that with his acute anglophilic affectations always on high display (right down to the tweed jacket with faux elbow patches) it would have been easy to scoff, but it is a testament to his skill and passion that I can still vividly remember specific lectures from his class; and this despite finding rather dry much of what we read and studied (English literature of in the later 18th Century). It is not easy to bring to life a long and tedious poem like Johnson’s Rasselas. But if anyone was up to the challenge, it was Fussell. I won’t go so far as to say he actually succeeded – it is a very dreary poem after all – but it is true that whenever I think of Johnson, I can still hear Fussell’s lectures, droll and insightful. But more than this, when I walked into my own classroom, I carried with me (consciously or unconsciously) much of what I observed in Fussell’s class. Some of this is the knowledge I gained in his course. Fussell’s lectures on Edward Gibbon, for example, were exceptional and when I talk to my students about Gibbon, it is automatic that I make reference to his insights. But it goes beyond this, for Professor Fussell cared a great deal about undergraduate teaching and this showed through in how closely he reviewed our written work. Each assignment came back with copious and usually highly critical marginalia along with a carefully typed out sheet of comments for us (using an old typewriter, no less). And he was a fiendish grader. To get an A on an assignment in Fussell’s class was a real achievement indeed. I cannot pretend to live up to his high standard of teaching; but from that experience I absorbed the lasting and fundamental value of a grade well-earned.